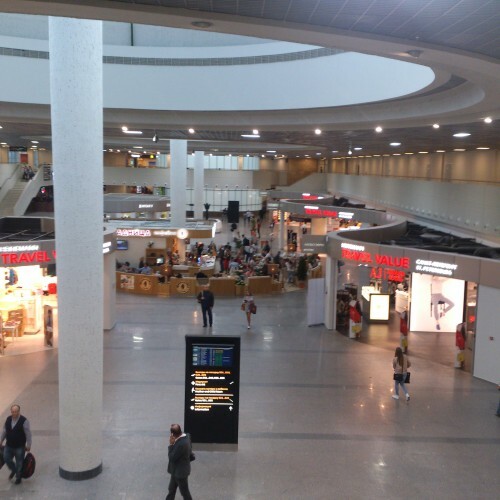 "one of the worst airports"
✅ Trip Verified | Pulkovo airport is one of the worst airports I have ever been to. First of all, there are no self kiosks anywhere, so even if you don’t have luggage you have to wait for the check in counters and they only open two hours before the flight. (International flight). We had to wait on our feet for a long time and its exhausting. The personnel in general were not friendy or helpful, they like to ignore you a lot. They are uneducated and very rude. Almost no one knows English and they don’t care about this. They act as if everyone should know Russian. Police at the passport checks don’t even understand basic words like yes and no. They can’t commumicate with you. An airport and personnel like this doesn’t suit such a beautiful place like St Petersburg. It feels like a local airport. One suspects how this airport could be an international airport that is hosting the world cup this year. It would be an ok local airport but it doesn’t deserve to be called an “International airport”. "still has a long way to go"
❎ Unverified | I haven't been to this airport in years and I must say it has changed a lot for the better but still has a long way to go. The arrival zone is small and grey with a few rows of very old and dirty seating. The only colourful spot was a red warning sign right in the middle about taxi fraudsters. The washrooms have probably seen better days and could use some maintenance. We waited quite a bit for our luggage, but after that everything was pretty quick, no big lineups at the passport checks and we were out in no time. The best part of this airport is its exterior, looks nice and modern. The departure zone was a bit strange. You can get a luggage cart at the airport entrance but you won't get far with it. They run the luggage through the scanners right at the entrance, even before the registration desks, and you can't get the carts past the scanners, so after the bags are scanned you're stuck without a cart and have to carry your bags to the airline counter. There are self check-in kiosks but only the third one I tried actually worked, the passport scanner still didn't work and I had to type all the information myself but at least it printed the boarding passes for me. But even with the boarding passes you still have to stand in the airline registration line where they check in the bags, take the boarding pass you just printed away and give you a different one. Staff at the check-in counter were very nice and helpful. There were a couple of cafes and a restaurant but the service at the restaurant was very slow. Security and passport checks were a bit slow but not too bad, no super big lineups there. There was some shopping in the duty-free zone. The duty-free zone was actually not too bad, albeit relatively small. The flight left on time. 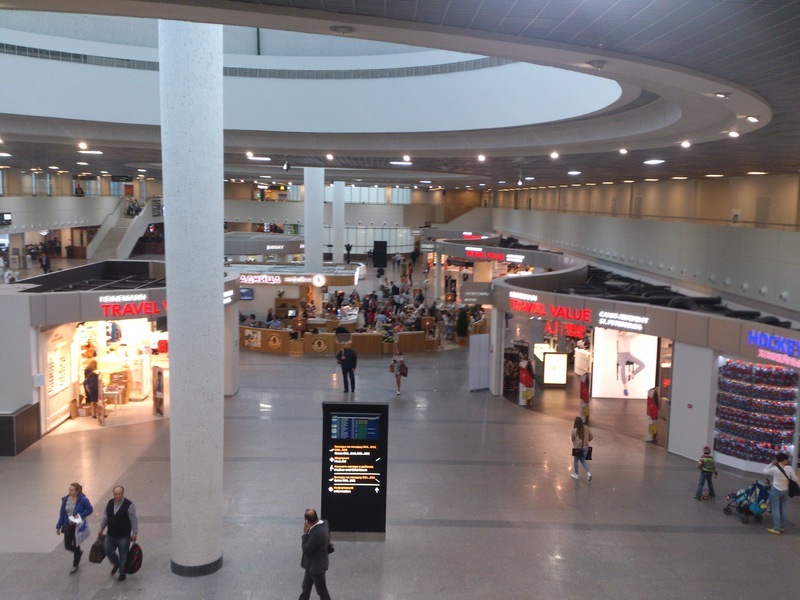 International arrivals at St Petersburg airport are at the newer terminal which is spacious but simply decorated, probably below the standard of a modern airport, but international flights are not too frequent and it is never congested. On your first arrival you may feel uneasy, but it is smooth if you know your way. To book a taxi, it is good to book inside with taxi stands which charges a reasonable standard fare of under 1000 ruples to town, and if you do not have the currency you may even charge your fare on a credit card. The train is not recommended as it terminates far from town. To go to the airport, book a taxi but specify the use of a metered city taxi, or you pay double (if not specified, hotels will book you a non-metered taxi and if so agree on a fare first). 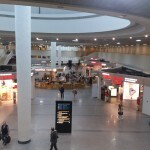 The airport is inadequate in facilities such as shopping and food outlets but is not bad. Beware of taxi scams. There is an official taxi desk on coming through customs which will give you the taxi number plate, colour and make of car, name of driver and price of trip. On exiting, a man looked at my paperwork for the car and claimed it was his car. By the time my suitcases were loaded in his car, it was too late to back out (I hadn't checked the number plate). I was then taken to my destination and charged five times the quoted price according to a 'taxi meter' on his mobile phone. I refused to pay and photographed the number plate - he stopped me from photographing him. Will notify the police although suspect they won't be interested. From the city to the airport in 20 minutes. The new terminal is fine. Beautiful geometric lines used in the design. Check-in for flight did not take too long. The old building renovated and converted into a zone of local flights. There are many shops and cafes. There was a small queue of pre-control before departure. This is ridiculous. 1st time trying out Allegiant Air at St Pete (PIE) airport and I would never recommend it! This is the first and last time I will be here. The air conditioning doesn't accommodate the number of people you check in and wait standing in line with no AC no seating (except wheelchairs which I'm sure they charge extra for). Supposed to board at 6am still standing in line with no AC at 6am. So many people that the door outside remains open so more hot air pours in. I'll take Tampa Intl from now on. We passed through this airport from a domestic flight from DME using a new terminal. The facilities inside the new terminal are good. It is spacious and very modern terminal. Good connection to city centre via nearby Metro station. The shuttle bus is inexpensive (RUB25 per trip) but the bus is usually crowded. Security was quick and easy. My first impression of this airport was good. This airport might be acceptable if we were living in 1952 but by today's standards it is shocking. Waiting areas at the gates for flights have less room then the airport in St. Vincent few seats no shopping and no cafes. I couldn't believe that this is the airport of the second city of Russia. Allow lots of time for security checks. Passport Control was speedy. Just pray you don't have to use this airport when multiple flights are taking off. A new airport is being planned for the future. From 50+ airports I have been to never seen Pulkovo-1 (domestic terminal) would definitely be the worst. No electric stairs operational bad smell toilet only in main building and not at boarding gates 1-6 old building from Soviet era with half of lights missing or burnt limited to no information panels etc. Watch out for taxi scams at this airport. We were approached by a man with official-looking identification right in front of the official taxi booth. We thought he was one of their staff. He directed us to an unmarked vehicle whose driver extorted us for twice the official fare. Insist on booking your taxi at the booth itself and ignore anyone else. The airport authorities and the staff of the official taxi booth who could see what was happening seem unconcerned about the issue.